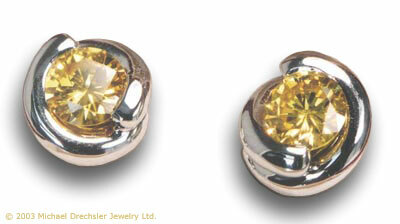 Spectacular matched earrings with lab created diamonds, two perfectly cut, 5 millimeter gems, 2 = .98 carat, intense yellow color, VS clarity. The 18 Karat white gold frames brings out the diamonds exceptional brilliance. Wear with easy to use, secure European alpha backs.